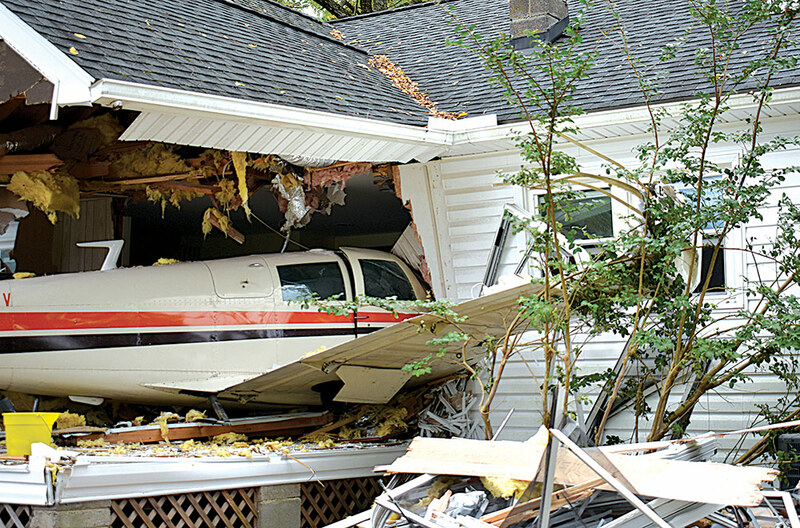 TOPPING—So many things went wrong on Saturday, October 7, when a plane crashed into a home near the end of Hummel Airfield runway at Topping that it took at least two “miracles” to fend off a more tragic ending. One “miracle” was that the three people inside the Mooney M2DC four-seat plane survived the crash, and the other “miracle” was that no one was in the house when the plane hit in the 400 block of Eubank Landing Road. The Virginia State Police (VSP) were informed at about 9:02 a.m. that the plane had crashed into an unoccupied dwelling in Middlesex. By that time, rescue efforts were already in the works. A neighbor, Greg Rhule, was on the scene 10 minutes after the plane hit the tops of two tall trees, clipping off portions of the wings, and crashed into the house’s sunroom. A piece of wing remained wedged in one of the trees, evidence of how close the plane came to having an even more serious crash. Rhule said Greg Weik was not the first on the scene but was the first person to enter the house and help. “There was a smell of aviation gasoline and since the plane had just been filled with gas at Hummel Field it had 40 gallons aboard,” said Rhule.